Sand Hill is the sister of the more dramatic Hopegill Head, with the two summits separated by one fifth of a mile and a minor dip. Nevertheless the two fells feel very different - at least at the top - with Hopegill Head being memorable for its ridges, it soaring position and its rocky top, while Sand Hill is remembered most for the steep pull up from Coledale Hause. The fell can lay a claim to part of Hobcarton Crag, but that dramatic drop lies a bit too far from the summit to be seen. Sand Hill does offer good views down Gasgale Gill and better views of Gasgale Crags than from Hopegill Head, but it would require very specific circumstances for the walker who reaches the top of Sand Hill to not also visit Hopegill Head (gale force winds would do it - the top of Hopegill Head isn't the safest place to be in a storm!). 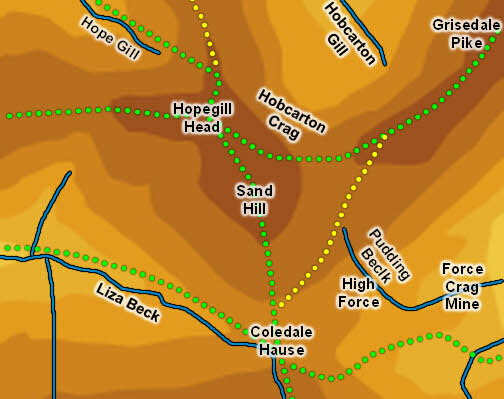 Sand Hill can be reached by four routes - two direct to the summit and two via other fells. Most obvious is the simple walk from Hopegill Head, across a slight grassy dip. More impressive is the walk from Grisedale Pike, down the north-western ridge of that fell, over the intermediate summit at the eastern end of Hobcarton Crag, and above the first part of that crag. When that path begins to level off head west up the simple grassy slope to the summit. The direct routes both bring us to Coledale Hause, south of the summit. From the east use the long track up Cole Dale, turning off to the left just before Force Crag Mine. A second mine track climbs up to the shelf above Force Crag and a good path then leads to the Hause, where we turn right to reach Sand Hill. The fourth route starts at Lanthwaite Green, above Bassenthwaite, and runs up Gasgale Gill. There are one or two awkward moments very early on where the valley narrows to pass Whin Ben and storms have eroded some parts of the path, but after a rocky step near a waterfall the rest of the path is clear. This brings us to Coledale Hause, where we turn left. We visit Sand Hill during our ascent of Whiteside and Hopegill Head, returning via Gasgale Gill. The top of Sand Hill is a gently dome covered with broken fragments of rock. The top is only really visited because the path from Coledale Hause to Hopegill Head runs right across it. The clearest boundary is to the south-west where Liza Beck forms the border with Grasmoor. A nameless beck forms the western boundary, although on the lower slopes the boundary with Hopegill Head is vague. To the north Hobcarton Crag really marks the edge of Sand Hill rather than any becks in the valleys below. To the south-east Pudding Beck forms the boundary with Grisedale Pike, running amongst the upper, and far less well known, part of Force Crag Mine. There is no beck in the top of the valley that runs east from Coledale Hause and forms the boundary with Crag Hill. Sand Hill has no tarns. The south-eastern slopes of the fell house some of the upper levels of Force Crag Mine, at one point the last working mine in the Lake District and now in the hands of the National Trust.